Greetings again from the darkness. Given that his last “true” story movie was Pearl Harbor (2001), and he is best known for the endless stream of Transformers movies (yes, another one is on the way), it’s understandable how we could be apprehensive (to say the least) about director Michael Bay taking on the Benghazi story. A sigh of relief is in order as the film pays tribute to those who deserve it while still providing Bay the opportunity to blow stuff up, and display his always-annoying tendencies with a camera. The incredibly courageous soldiers, who comprised the CIA security team (GRS) of contractors that saved many lives, are the heroes of the story and heroes in real life. Bay never loses focus on their bravery and dedication, and avoids the temptation of taking an obvious political stance in telling their story. At the same time, he doesn’t shy away from making a weaslley CIA administrator type (played by David Constable) the face of bureaucratic incompetence. 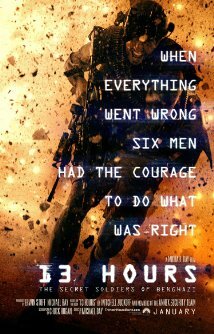 The six man team is played in the movie by John Krasinski (as Jack Silva), James Badge Dale (beefed up from his “Pacific” days as Tyrone “Rone” Woods), Pablo Schreiber (as Kris “Tanto” Paronto), David Denman (as Dave “Boon” Benton), Dominic Fumusa (as John “Tig” Tiegen), and Max Martini (as Mark “Oz” Geist). All six actors are clearly proud to represent these men, and though wise-cracks abound, there is absolutely no Hollywood preening or posturing … these are gritty, well-trained, dedicated warriors. So much as been written and debated about what happened during the 2012 siege that resulted in the tragic deaths of four Americans, including that of U.S. Ambassador Chris Stevens. But given the reputations of those in the CIA and the State Department, it’s doubtful full disclosure will ever replace the holes of doubt that exist, so studying the action sequences makes sense … though we also get a Joseph Campbell reference. Chuck Hogan adapted Mitchell Zuckoff’s book for the film, and in between the rapid gun fire and missiles, that deafening silence you hear is Washington, D.C. This entry was posted on Sunday, January 17th, 2016 at 4:15 pm and is filed under Action, Drama, War. You can follow any responses to this entry through the RSS 2.0 feed. You can leave a response, or trackback from your own site.